If you are visiting this page, your loved one has likely been caused harm in a nursing home or extended care facility. Generally speaking, injuries that arise from poor nursing home care include things such as pressure ulcers and bedsores, falls that cause broken hips and head trauma, as well as other types of injuries or even death resulting from malnutrition or choking on food. There are remedies against nursing homes when they provide substandard care. Generally speaking, these types of claims are settled without the need for litigation. However, if the matter cannot be resolved through settlement negotiation to the satisfaction of the family, the claim is filed in a process called arbitration. Arbitration is different from court because a jury does not hear the facts of the case, but rather a lawyer who serves as a type of judge enters findings after the litigation process has concluded. Many families are turned off or discouraged by the arbitration process because it can be expensive and many times result in unfavorable outcomes for the injured party. Farris, Riley & Pitt, LLP has been successful in navigating the arbitration process on behalf of victims of nursing home neglect. If you have a case with merit, arbitration does not deter our firm from pursuing justice. If we can help you or your family, please give us a call. Across the United States, millions of people wake up every day in nursing homes. In Alabama, many of these individuals are helpless, vulnerable, and completely dependent upon the Alabama nursing home staff to meet most or all of their needs. Nursing homes in Alabama and around Birmingham are responsible for providing care to elderly and disabled residents. Unfortunately, the quality of care in the nursing home industry has increasingly declined over the past decade. A number of recent studies indicate that residents in nursing homes suffer abuse and neglect more and more frequently at the hands of nursing home corporations. In many cases, residents have died or have been severely abused from neglect in a nursing home. Farris, Riley & Pitt, LLP represents direct victims of nursing home and elder abuse as well as their families. Call (205) 324-1212 right now to take advantage of a free consultation that will let our Birmingham nursing home abuse attorneys review your case and help you understand all of your legal options. Why Do I Need a Nursing Home Abuse Lawyer? For many families, nursing home and elder abuse incidents often prompt understandable outrage. The abuse of a loved one leads to an increased desire to get justice. You may be contacted by an insurance company for the negligent nursing home and an agent may try to offer you a settlement to resolve your case. Rest assured, whatever you are offered will be woefully short of what you are actually entitled. It is in your best interest to refuse to speak to any insurer until you have legal representation. Depending on the specific circumstances of your case, you may be eligible for various kinds of damages, and you do not want to jeopardize your ability to recover compensation because of something you said in a phone conversation recorded by an insurance company. Farris, Riley & Pitt, LLP can handle all conversations with insurers on your behalf and immediately engage in negotiations for a fair and full settlement. If the insurance company fails to make a satisfactory offer, we will file a lawsuit to try your case in court. Kirby Farris and Ken Riley were both born and raised in Alabama, and they and their families are now Birmingham residents. The law partners are both admitted to the United States District Court for the Middle District of Alabama, United States District Court for the Southern District of Alabama, and United States District Court for the Northern District of Alabama, as well as the Alabama Supreme Court. Mr. Farris and Mr. Riley are members of the American Bar Association, Alabama Bar Association, and Birmingham Bar Association. The attorneys have secured several multimillion-dollar verdicts and settlements. The people we represent are not just clients, but are our friends and neighbors. Our firm works closely with nursing home and elder abuse victims and their families to help them recover the compensation they need and deserve. If you or your loved one has been the victim of nursing home abuse or elder abuse in Birmingham or a surrounding area of Jefferson County, you will have a dedicated legal advocate when you work with Farris, Riley & Pitt, LLP. You can have our lawyers provide a complete evaluation of your case when you call (205) 324-1212 to set up a free consultation. Chapter 9E of Title 38 of the Alabama Code is also known as the Protecting Alabama’s Elders Act. Alabama Code § 38-9E-2(3) defines an elderly person as a person 60 years of age or older. The Protecting Alabama’s Elders Act establishes laws for the criminal offenses of elder abuse and neglect and financial exploitation of an elderly person, both of which are classified into three degrees. Persons reporting or investigating violations are afforded immunity from civil liability under Alabama Code § 38-9E-10. Physical Abuse — Residents of nursing homes or other elderly victims may suffer serious injuries, such as fractures, lacerations, sprains, internal bleeding, traumatic brain injuries, or spinal cord injuries when they are physically assaulted or mishandled by nursing home staff. Unexplained cuts, bruises, or broken eyeglasses are frequent signs of physical abuse. Sexual Abuse — If an elderly person is suddenly diagnosed with a sexually transmitted disease, it is usually an indication that they have been the victim of nonconsensual sexual activity. Warning signs may include bleeding, bruising in the genital area, or infections. Psychological Abuse — Not all abuse involves physical contact. Some nursing home staff members may abuse residents by deliberately ignoring them or engaging in verbal abuse or harassment. Symptoms of emotional abuse usually include residents expressing fear about certain employees or acting more reserved than usual. Neglect — Some nursing homes simply fail to provide the necessary assistance to residents. Inattentive staff can lead to victims possibly being injured in falls, taking incorrect medications, or just simply living in unacceptable conditions. You should probably be concerned if your loved one is wearing dirty or soiled clothing or their living space appears unkempt. Also look for signs of possible malnutrition which may indicate that the resident has not been getting proper meals. Financial Abuse — Some nursing home staff members may gain access to a resident’s financial records or accounts and try to exploit them financially. Common warning signs in these types of cases include sudden large cash withdrawals, unexplained changes to wills or other estate planning documents, and forged signatures on other types of financial transactions. Nursing homes themselves are usually named as defendants in most civil actions, but other third parties could bear liability in certain cases. For example, injuries caused by a person not employed by the nursing home may lead to claims against that individual as well as possible negligent security claims if security was provided by an independent company. Which agencies do I contact if I suspect nursing home abuse or elder abuse? Whenever you suspect immediate harm, you should not hesitate to contact the local law enforcement agency, such as the Birmingham Police Department or the Jefferson County Sheriff’s Office. You may also want to contact the Alabama Department of Human Resources and the Bureau of Health Provider Standards within the Alabama Department of Public Health, which are charged with the responsibility of investigating occurrences and allegations of elder abuse. The Alabama Department of Senior Services operates Alabama’s Elder Justice and Advocacy Program. Bedsores (also called pressure ulcers) are commonly referred to as being in stages. According to the United States National Library of Medicine, Stage I is the mildest stage of bedsore involving skin redness and pain, Stage II involves blisters or open sores, Stage III involves “craters,” or open, sunken holes in which tissue below the skin is damaged, and Stage IV bedsores are so deep that muscle and bone have been damaged. An advance directive is a written instruction that you make while you are mentally competent. It clarifies medical treatment you may or may not want to receive in the event that you become unable to communicate your wishes for any reason. Hospitals, nursing homes, and other health care facilities are required by federal law to inform patients or residents about advance directives, but people are not necessarily required to have one. Alabama law recognizes two different types of advance directives: the Advance Directive for Health Care and the Health Care Durable Power of Attorney. The Advance Directive for Health Care includes sections for a living will and proxy appointment (or Health Care Durable Power of Attorney). The Alabama Department of Public Health reported that elder abuse affected 4,622 victims in 2013. Elder abuse occurred at a rate of 12.4 per 10,000. A study published in Women’s Health Issues found that institutionalized adult women with disabilities reported a 33 percent prevalence of having ever experienced interpersonal violence. Another study of 342 adult men published in the Journal of Rehabilitation found that 55 percent of men experienced physical abuse by a person after becoming disabled, and almost 12 percent of the cases involved physical abuse by a personal assistance service provider. A study on elder abuse by family members published in the Journals of Gerontology Series B, Psychological Sciences and Social Sciences found that victims most frequently reported verbal mistreatment (9 percent), financial mistreatment (3.5 percent), and physical mistreatment (less than 1 percent). According to the National Center on Elder Abuse, almost 1 in 3 nursing homes in the United States were cited for violations of federal standards that had the potential to cause harm or that had caused actual harm to a resident. A 2001 U.S. House of Representatives Report found that nearly 1 out of 10 homes had violations that caused residents harm, serious injury, or placed them in jeopardy of death. A separate study of 2,000 interviews of nursing home residents in the report from the Atlanta Long Term Care Ombudsman Program and Atlanta Legal Aid Society to the National Citizens Coalition for Nursing Home Reform found that 44 percent said they were abused and 95 percent said they had been neglected or seen another resident neglected. More than 50 percent of nursing home staff admitted to mistreating older patients within the prior year in a study published in Nursing Management, and two-thirds of those incidents involved neglect. 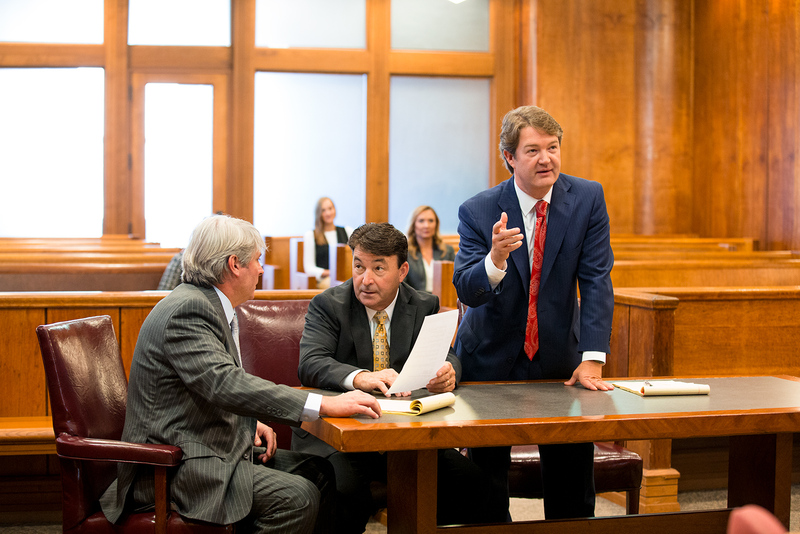 For more than two decades, Farris, Riley & Pitt, LLP has fought for injury victims in communities all over Alabama. We understand how violated victims of nursing home abuse and elder abuse feel, and we make it our mission to get justice for these families. Did you suffer serious injuries or was your loved one injured or killed because of nursing home abuse or elder abuse in Jefferson County? Call (205) 324-1212 or contact us online to have Farris, Riley & Pitt, LLP review your case and discuss all of your legal options during a free consultation.